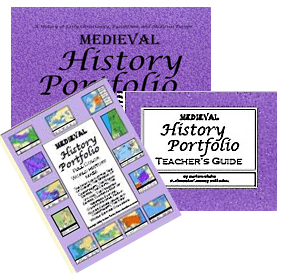 Medieval History Portfolio - Classical Homeschool History Curriculum. Research, Read, Write, Illustrate ... Tell the Story. Research, Read, Write, Illustrate . . . 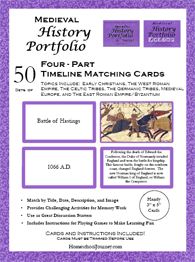 Perfect for families with more than one child using the Medieval History Portfolio "classic". *Reflects a discount of $10.00, a 17% savings. The Medieval History Portfolio contains landscape oriented cardstock pages, bound in a sturdy and attractive 3-ring binder. Each Portfolio includes a Table of Contents, chapter divisions, black line maps, and a unique timeline. Portfolio pages are specially formatted with a system of frames–referred to as "text boxes" or "image boxes"–for reports and images. *Combine the Portfolio with the Full Color Maps and the Teacher's Guide. The Junior Portfolio is a modified version of the "classic" Portfolio, with the same chapters and chapter order as the "classic". The Junior notebooking pages include black line maps, images and puzzles, and full-page coloring images. Each Portfolio also comes with a special Junior version of the Teacher's Guide, and includes a concise bibliography, ideas for multi-level written work, additional images and puzzles, plus instructions and components for numerous "lap-book" style booklets. No separate Teacher's Guide is required. Rely on the Teacher’s Guide to provide written assignments, images, and various puzzles and activities for each and every “text box” or “image box” in the Portfolios. Works with any narrative history stories, text books, or non-fiction sources of your choice. Each of the full color reference maps correlate with the black line maps provided in the Ancient History Portfolio "classic" and Junior. The Spread of Christianity, The Roman Empire, The Celts, The Vikings, The Frankish Empire, Cultural Map of Western Europe, Constantinople, Kublai Khan’s Empire, Islam and Christianity, The New World Before Columbus. - Handy, Four-Part, 3"x5" cards. Download your own set of Timeline Matching Cards to use as a convenient resource. Once downloaded, print the cards on 3" x 5" index cards, OR print on 8 1/2" x 11" card stock paper and trim before use.